Pediatrics. 2016 Jan;137(1). doi: 10.1542/peds.2015-1313. Epub 2015 Dec 31. Sethuraman G1, Marwaha RK2, Challa A3, Yenamandra VK3, Ramakrishnan L4, Thulkar S5, Sharma VK3. Severe vitamin D deficiency and rickets are highly prevalent among children with congenital ichthyosis. We report an incidental observation of a dramatic and excellent clinical response with regard to skin scaling and stiffness in children with congenital ichthyosis after short-term high-dose vitamin D supplementation that has not been previously described. Seven children with congenital ichthyosis (5 with autosomal recessive congenital ichthyosis; 2 with epidermolytic ichthyosis) and severe vitamin D deficiency (and/or rickets) were given 60,000 IU of oral cholecalciferol daily for 10 days under supervision. All children were subsequently put on recommended daily allowance of 400 to 600 IU of cholecalciferol. The main outcome measures observed and studied were reduction in skin scaling and stiffness of the extremities. All cases had severe vitamin D deficiency (serum 25-hydroxyvitamin D < 4 ng/mL) and secondary hyperparathyroidism. Six patients had clinical and radiologic evidence of rickets. Significant improvement in scaling was noticeable by day 5, showing further improvement by day 10, in 6 of the 7 cases. 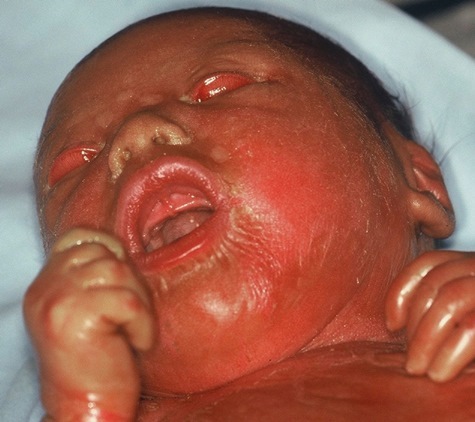 At 1 month, the skin had become near normal in all the cases of autosomal recessive congenital ichthyosis. Remarkable reduction in stiffness was also observed in all children. Supplementation with high-dose vitamin D followed by recommended daily allowance appears to be an effective form of therapy in the management of congenital ichthyosis with vitamin D deficiency.